One of the easiest and highly satisfying Japanese dishes is Teriyaki. Its defining elements are the soy sauce+mirin+sugar glaze and the grilling or broiling technique. A lovely combination which makes my mouth water a bit just thinking about it. Teriyaki dishes can be based on varying ingredients from fish (tuna, salmon or mackerel) to meat (chicken, duck, pork, lamb or beef). And don’t forget to try it with meatballs or squid too! Really versatile as the sweet-savoury taste goes well with different base ingredients. 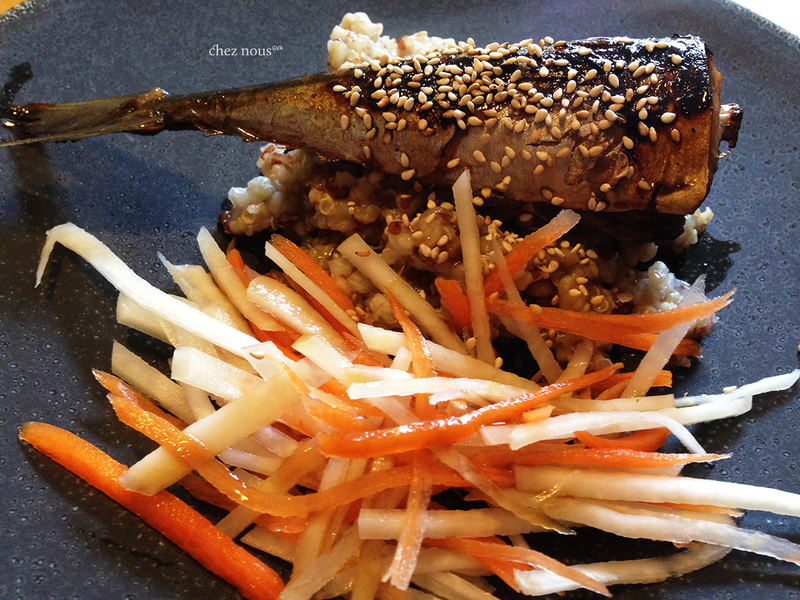 For our Mackerel teriyaki, we opted to pan-grill it after braising it in the marinade. This is a great way to let the fish absorb as much of the taste as possible. But if you have very fresh fish (literally just out of the sea kind of fresh), you can skip the braising and directly grill after marinating. You would want to keep that grilled-fresh-fish taste and texture. My dad always says that fish tastes better when eaten with your fingers. I don’t know what it is, but this is so true! So don’t be shy, put aside the cutlery and dive in with your fingertips. Mix together all marinade ingredients, and pour half of the mixture over the mackerels. Set aside half of the marinade for the sauce. Marinade the fish for about 10 minutes. While marinating, mix together the rice vinegar, sugar, salt, pepper and sesame oil. Add the carrots and kohlrabi to the mixture leaving to pickle a bit for about 30 minutes to an hour. Place the marinated mackerels together with half the marinade in a pan. Cook covered over medium heat until marinade dries up and evaporates. Add a few drops of canola oil into the pan. Turn up the heat and pan-grill the fish until there’s a beautiful caramelized coating. Be careful not to burn them. After 1-2 minutes, remove the fish and serve in a dish. Sprinkle over some toasted sesame seeds. Now, place the rest of the marinade you have set aside in a saucepan. Boil over medium heat, and add a bit of diluted cornstarch (1 tsp cornstarch + 3 tbsp water). Leave to boil and mix until the sauce is thick and homogenous. 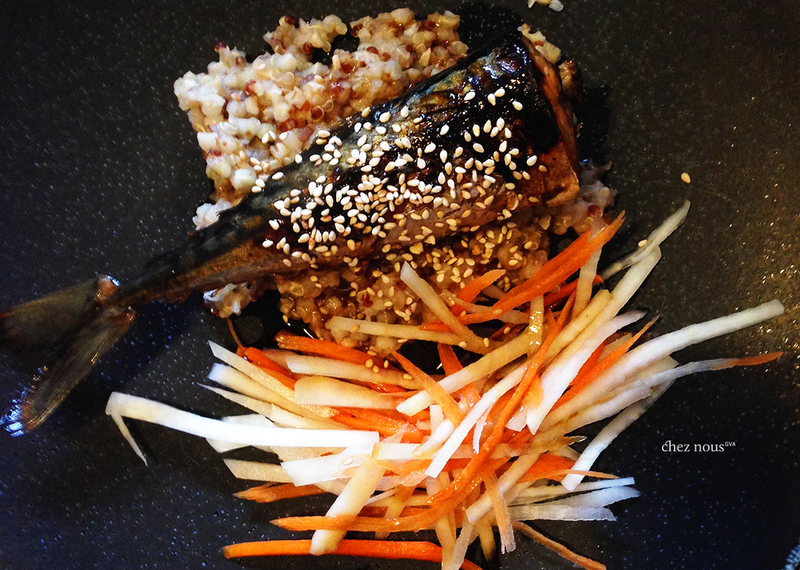 Serve your Mackerel teriyaki over steamed rice, or over a bed of quinoa-boulgour as we did, and a side of pickled carrots/kohlrabi. Dress with the teriyaki sauce and enjoy!